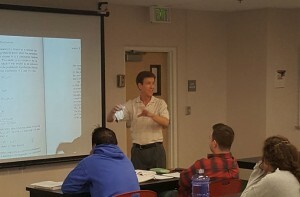 Math professor Mark Schilling in the classroom. Photo courtesy of Mark Schilling. It might seem reasonable to believe a random event is always, by its very nature, unpredictable. However, mathematics would beg to differ. Mark Schilling, a professor of mathematics at California State University, Northridge, has won the Mathematical Association of America’s (MAA) 2017 Chauvenet Prize for an article he wrote on the subject of probability. His central tenet challenges the very notion of unpredictability. The article, titled “The Surprising Predictability of Long Runs” and published in Mathematics Magazine in 2012, focuses on how certain patterns and repeating sequences virtually always appear within an extended series of events, and how these seemingly arbitrary occurrences often can be predicted reliably. Schilling received a Ph.D. in statistics from the University of California, Berkeley and has taught math at CSUN since 1985. He said he believes that statistics and probability “go hand-in-hand.” The tendency for people — his students included — to view patterns and repetition as anomalies contributed to his interest in the article’s topic, Schilling said. “People generally don’t expect specific outcomes to happen many times in a row in random phenomena. Therefore, we tend to give patterns meanings when they don’t really need special explanations,” he said. In his article, Schilling used a wide range of examples to illustrate the concepts and formulas he introduced, including Joe DiMaggio’s famed 1941 Major League Baseball hitting streak, the tendencies of roulette results and the number sequences that occur within Pi’s infinite continuum of digits. “When you start searching through Pi, you’d be surprised at how predictable its repetitive patterns are. You can bet good money that the sequence ‘2-0-1-7’ will repeat exactly three times in a row somewhere within the known 10 trillion digits of Pi. While it could repeat four or more times, or less than three times, the chance that the longest streak of repeats is exactly three is about 99.99 percent,” he said. Since 1925, the MAA has awarded the Chauvenet Prize annually to one or more authors of outstanding expository articles. Many renowned mathematicians have won the prize, which includes a certificate and $1,000. Schilling said the award surprised him, as the MAA selects a recipient without authors submitting their works for consideration. He also received the Pólya Award from the MAA in 1991 for an article he wrote about probability as it relates to coin tosses. Schilling said his interest in math stretches back to his childhood. He recalled doing well in the subject and when it came time to pick a path in higher education, he said the choice came naturally. “It was always something I was good at and enjoyed, and I knew I wouldn’t have to write a lot of term papers,” he said. Though Schilling said he isn’t sure if or when he will write another article about probability, he won’t rule out the possibility completely — so long as he remains interested in the topic.